When I adopted Kaliwohi from the Bureau of Land Management back in April, 2014, he was eighteen months old and wild as a, well, a mustang. Like most mustangs who have been captured, he was scruffy and unkempt and largely unhandled. Kiwi’s feet were a hot mess. The front feet were splayed with very low heels, and the hind feet resembled oversized clover leaves. Apparently, sometimes mustangs exhibit this “trefoil” look in one or more hoofs due to their primitive DNA. The hooves are not actually cloven in three parts, but there is a distinctly tri-part outline to the hoof, as opposed to the traditional round, healthy horse feet we’re all used to seeing. #WhoKnew? 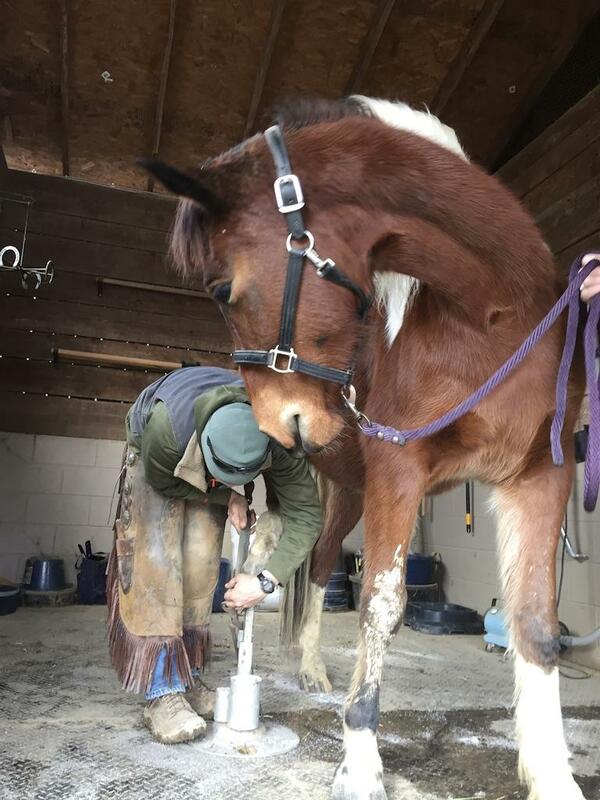 It takes time and an excellent farrier to help re-shape such feet. 2. Do I have to? 3. Can I eat it? 3. He could, indeed, balance on three feet. 5. You, sweet Kiwi, do not get a vote. My horses may never be Olympic champions, but they will have manners. Even the wild ones. So, Kaliwohi did, indeed, get all four feet trimmed that first day. And every six weeks like clockwork ever since, including one day this past week. 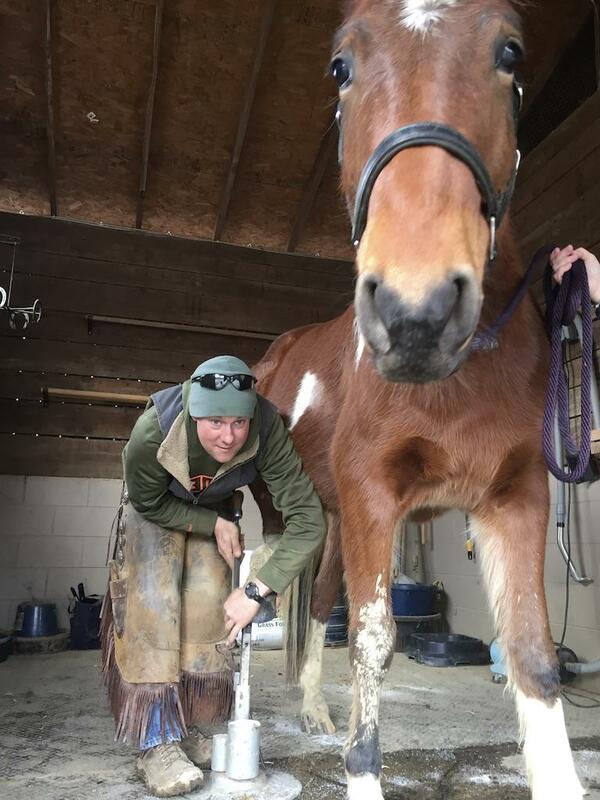 Farrier Kyle Hancock and his muddy mustang client, Kaliwohi. All photos by Sarah Frances Smith. Kiwi observing Kyle as he works. So what does hoof trimming have to do with us humans being “happy, healthy, & horsey,” you might ask? Speaking for myself, I don’t like calisthenics or yoga or anything that makes me get down on the floor. As much as I love horses and the outdoor life, raw honesty — I hate feeling dirty. I will mend fence, or work hay fields, or ride all day with the best of them, but at the end of the day, I like a hot shower and feeling clean. Like Kaliwohi, the very thing I tried to avoid has turned out to be something I need for my best health. And, like my mustang, I’m learning to relax and enjoy the process. The wonderful benefit is, as I relax and learn to enjoy yoga — even the floor positions — my breathing is deeper, my muscles are toning up, and my overall being is more relaxed and happy. Kaliwohi, cat-napping during his pedicure. What are some things you used to hate but now enjoy (or at least tolerate) on your own journey towards being happy, healthy, and horsey? Post in the comments! 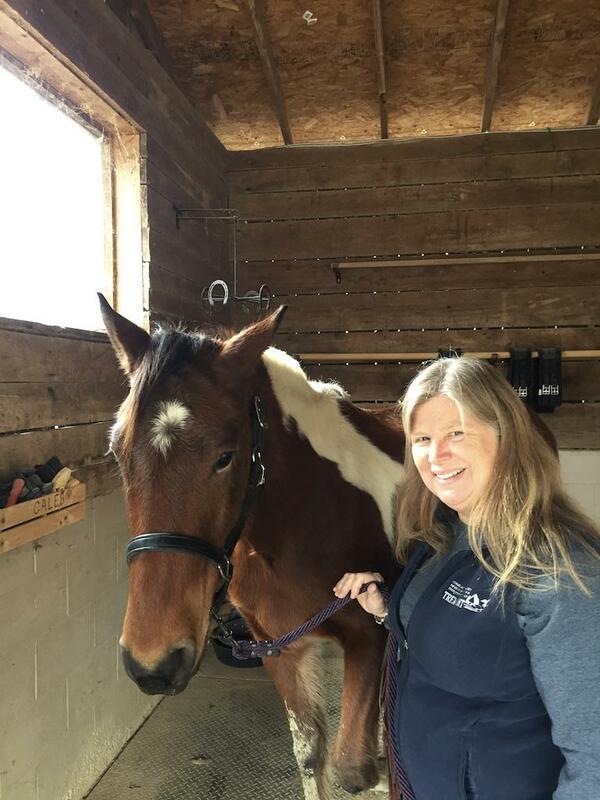 Want to learn more about useful tools to stay happy, healthy, and horsey? Join our Facebook group and page!